It's no secret that I'm slightly obsessed with cupcake cases, cupcake liners, paper patty pans... call them what you will; they're totally terrific. Mimi's fourth birthday is fast approaching and we have finally agreed on a Mermaid-Pirate Party Theme. In preparation, we've begun amassing Mermaid Party decorations (and a Pinterest mood board). The first to be made was a multitude of mermaid lotus flowers, whose how-to tutorial I have blogged before. 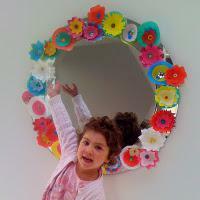 They are a truly fabulous craft project for kids; they're fast, forgiving, bright and beautiful. We added stickers of butterflies, and spotty-dots to the centres of many of them to make the activity last longer. I cut cases up to look like daisies, poppies, and every other flower I could think of and the girls assembled and glued them all together in their own imaginative ways. When we had about three dozen Mimi helped me stick them all around the mirror in our entrance hall. "Oh Mummy," she said, "they are sooo pretty!" I love rainbow craft (I made a Pinterest page as I've mentioned previously), and this girlie-girl craft project would work well for a rainbow, spring, mermaid or even fairy party theme. I'm not sure which was my favorite aspect of it this kids craft; making the flowers with my girls or seeing their satisfaction when it was all finished! For more inspirational images - pop across to our website and see what's inside our mermaid party theme craft ebook... and keep reading this blog for more pre-party preparation!